It would be really swell if the question title was included right above the preview of the body of the question. Every so often, I'll be asking about something and the very act of composing a good question helps me better refine the problem. I go back and forth between SO and my workspace testing other possibilities and working on getting the best SSCCE. As I'm going back and forth updating the question, I'm constantly looking down at the preview, making sure everything's just right. That is followed by a brilliant question that should have been titled something like How can I reduce manifold wear when using third-party flanges? This is exacerbated by the dupe suggestions. For a question of any length, the title I entered won't even be on screen by the time I'm near posting. Even when it is, it's easy to lose it up there as it's literally the smallest text on the top half of the page. Thankfully I can edit to go fix things, but it would be easier to just get it right the first time. I know that improving the quality of titles around here is of keen interest, and this seems like an easy change that wouldn't bother anyone. Seeing how there's continuing furor over automatic editing of titles, showing askers their title with the automatic edits applied might help a lot. Some people will post "Question title broken?" questions here on meta, but those are the people whose titles are currently being broken without them noticing. Hopefully everyone else will get the hint and write better titles. 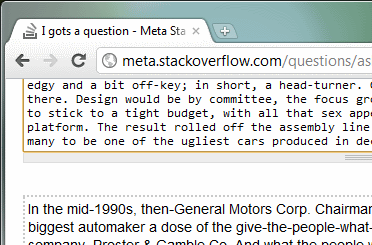 The title of your proposed question is also in the browser's window (tab) title area as you compose it on the /ask page. So no matter how far you've scrolled down, you can at least see the first (n) characters of your question, however many your chosen browser allows to appear in the tab / window. Not the answer you're looking for? Browse other questions tagged feature-request asking-questions markdown-preview . Why does the preview not show the title?